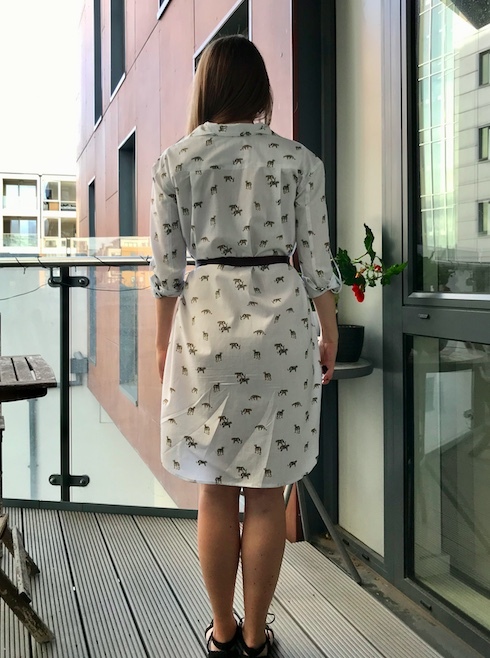 I've finished my first project for my holiday wardrobe and it is probably the one I was most excited about because of the fabric! 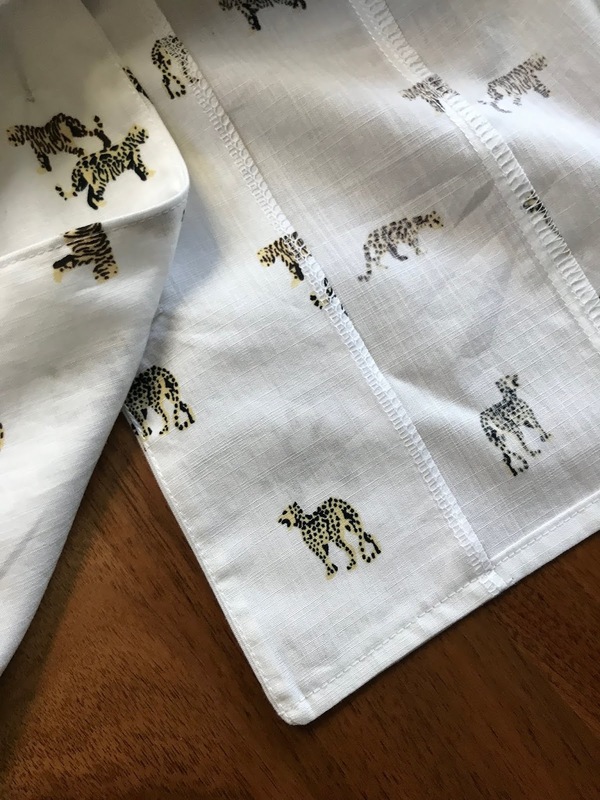 For those of you who haven't read my handmade travel wardrobe post I'm going on a safari holiday in January so when I spotted this beautiful cotton charting with mini big cat print stocked by The Fabric Store I couldn't resist ordering it. 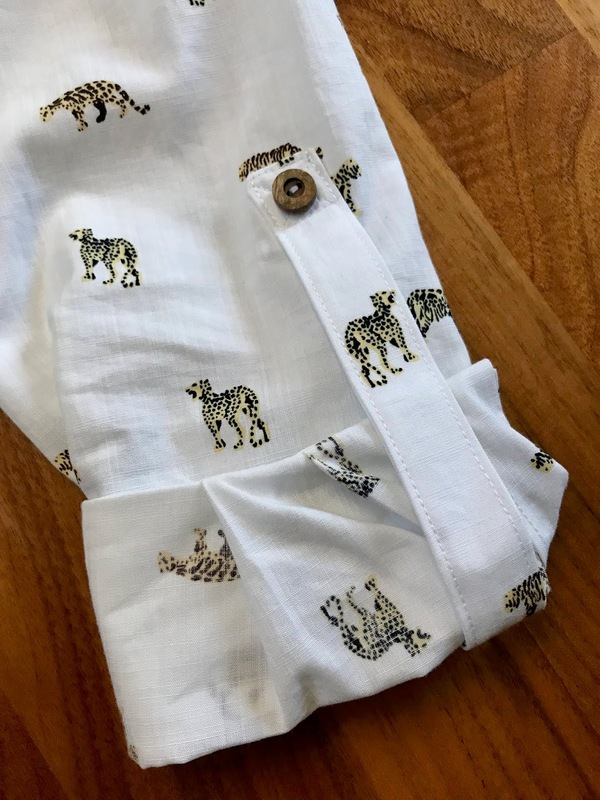 I had in mind a crisp little sleeved shirtdress with breast pockets and all those classic safari chic details and I'm delighted with what I ended up with, although I didn't get there without a bit of a struggle. I've been meaning to try a design from Hot Patterns for quite some time. 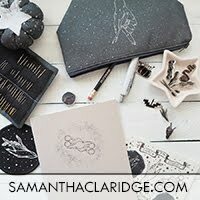 For a long time I've been eyeing them up on the Sewbox stand at the big craft shows and been intrigued by the big strong envelopes and wearable styles packed with interesting details. 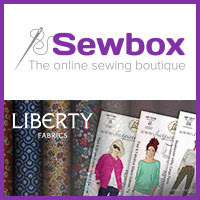 Sewbox stock a huge range of these patterns along with a good selection from other independent designers. I was having a little look through these styles when I spotted Hot Patterns 1237 - the Plain & Simple Favourite Shirt, Tunic and Shirtdress and it jumped out to me as having a lot of the features I was after; a relaxed fit and breast pockets with optional flaps, long sleeves with tabs plus lots of opportunities for topstitching along the princess seams and rear yoke. 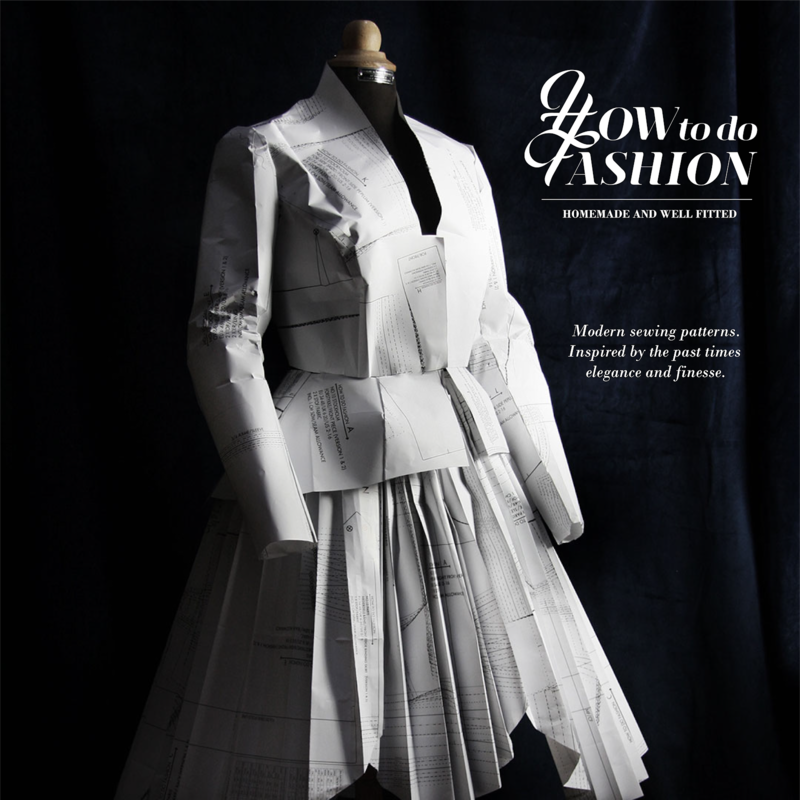 In general I really enjoyed sewing this pattern and liked the construction methods, details and drafting...it just came up really huge! Part of the trouble is entirely my fault as I had been warned that they run large so I should make a muslin. 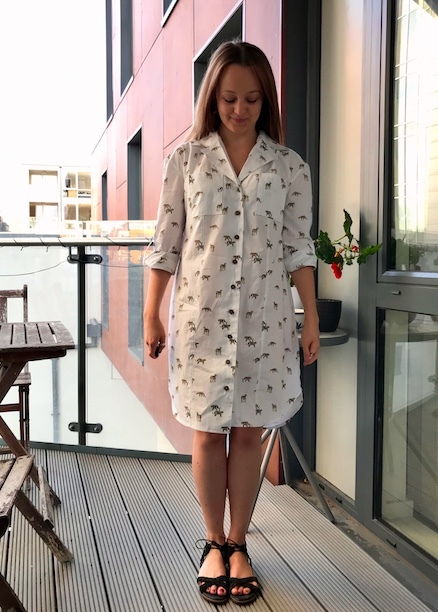 However a drought of sewing time over the summer has led to me being quite impatient recently with getting stuck into a project and as it was an oversized style I figured I could think carefully about the size I cut and adjust as I went. This approach was not right for what turned out to be a HUGE amount of ease! There is a very detailed body measurement chart on the back of the envelope but no finished measurements which would have been really useful. The patterns include an impressive range of sizes from 6-26 and I came up between the 8 and 10 so went with the smaller. I probably should have started from an even smaller size but there wasn't much smaller I could go. The recommended seam allowance is 3/8" and I used 1/2". After basting together the side seams I ended up taking out a whopping 1.5" on the double extra out including down the underarm seam grading gradually out to nothing at the cuff. That's 6" total and it still feels pretty roomy. I then lopped 6" off the hem; bringing it above the knee really helped to balance out the size of it as it was completely overwhelming my fairly petite stature. It wasn't just the general size that felt big, every aspect of the design felt large. 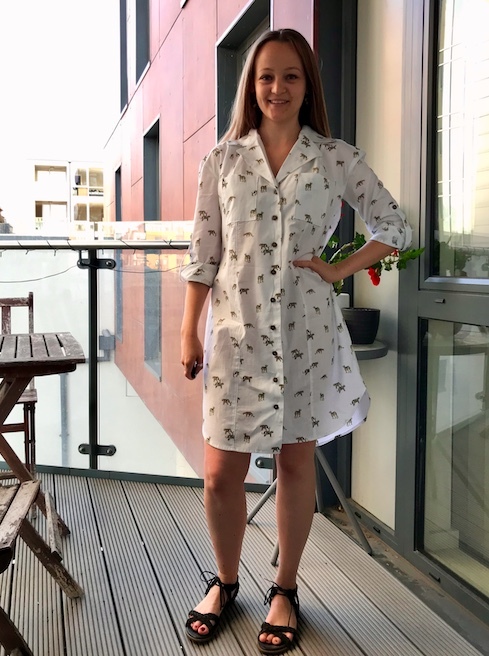 Sort of as if if owned a PDF copy of the pattern I would have printed everything at a much smaller scale and it would have fit better proportionally. The breast pockets were extraordinarily large and I reduced them by 2" in both width and height to leave me with a 5" x 4" rectangle instead. By that point was fed up with fiddling around to make things work and abandoned the pocket flaps! I might return to them at a later date as I like the idea of them buttoning. The only aspect that I still feel lis a little on the large side and I haven't been able to do anything about as it is finished quite early on in the construction process is the collar. It is growing on me but I feel like I want to reduce it by a centimetre or so. Any tips?! What was strange is that the whole thing is large apart from apart from the sleeves which are a good couple of inches short on me. Luckily I wanted to wear them rolled up and fixed with the tab feature but had I wanted to wear them long they look rather silly! The instructions tell you to sew the tab in place permanently but if you wanted the option to roll the sleeves down again you could easily do so by only fixing one end of the tab and sewing a buttonhole in the other end. I'm used to designs from one of the big four pattern companies including a lot of ease and this felt similar to working with one of those patterns in a lot of ways. The pattern sheets are laid out similar to the big four patterns with instructions and illustrations printed on to the pattern pieces rather than a separate booklet. It felt like there was a lot less of the information included at the start of the instruction booklet than by lots of indie companies but there were cutting layouts and brief sewing tips included. I don't usually pay that information much attention nowadays but like to look them over when I am trying a pattern company for the first time. In terms of the instructions I loved that the first steps were all about constructing the individual little bits like pockets, collar, sleeve tabs and facings so they are ready to apply to the main body further along. This is the way I usually sew. I often look ahead in the instructions and batch sew any bits like this. It is not only really satisfying to have all these bits ready when you need them but I also feel speeds me up as you can pin lots of little bits, then sew lots of little bits, then press lots of little bits rather than moving from station to station repeatedly. I would recommend sewing another shirt with more detailed instructions or researching shirt sewing techniques before tackling this pattern. 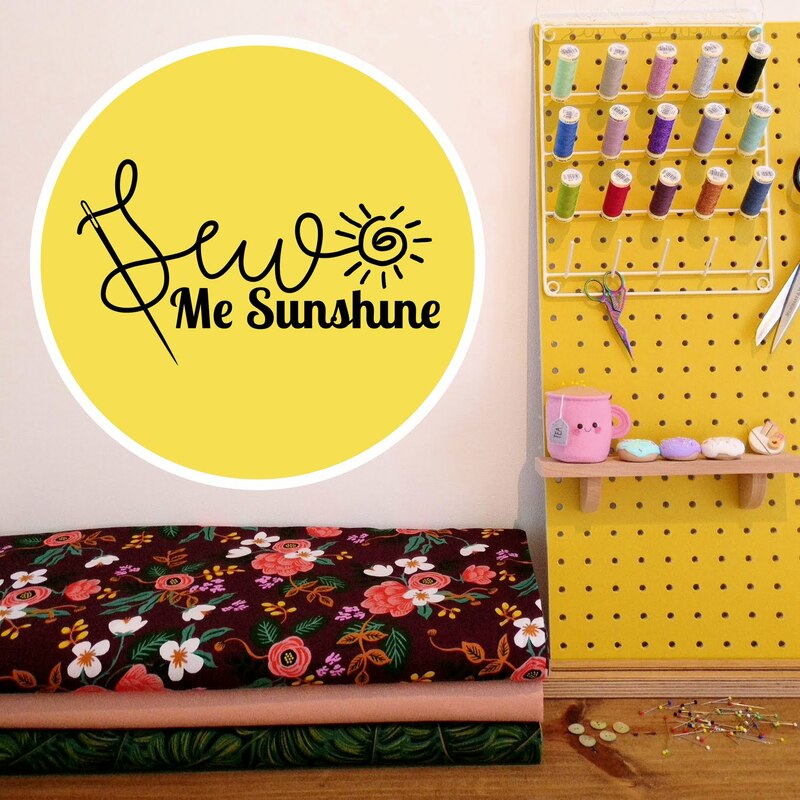 The construction method is excellent but each step of the instructions is only explained fairly briefly and relies on you having some sewing knowledge. I don't think there is anything wrong with that and the pattern certainly provides you with everything you need but lot of indie sewing patterns have instructions so detailed you can basically learn to sew from them so be warned if you are a beginner, you will need to do a bit of extra research to achieve the best finish. Pay attention to both the illustrations and the written instructions and look them over more than once. They don't include a lot of information but it is important to look at the stitching lines and where to clip etc. The yoke is cleanly finished but there is no mention of when and how to finish seams which is weird as if you don't you can end up with raw edges under the pocket flaps, along the major seams and raw facings. Having said that there are some great tips included, such as to sew both your patch pocket pieces together, press and the unpick to give you two perfectly even pocket shapes. I particularly liked the method for constructing and finishing the sleeve plackets. So quick and neat. 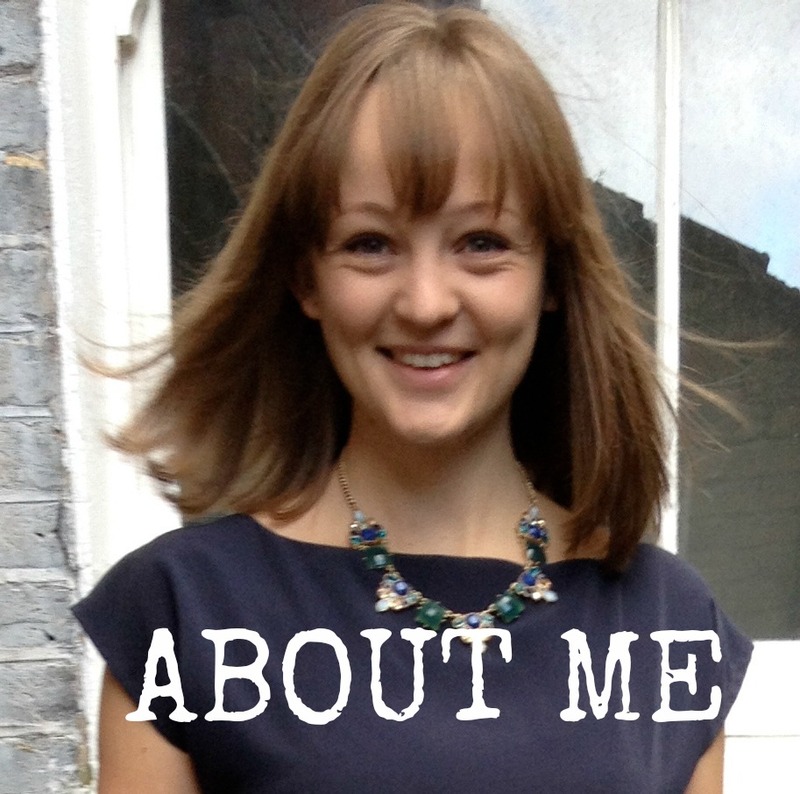 The sleeves are two piece which is a lovely feature and gave me scope for more topstitching! I also love the curved shirt-tail hem shape but would recommend making that hem as narrow as you can to help you deal with easing it around those tight curves. There is no topstitching included in the instructions as the pattern is designed to have a clean look but I added in lots of it! Partly because that was the look I was after and partly because I just love doing it. I used the same standard white sew-all thread I was using for the constructiosn and did most seams as a faux flat fell by overlocking the allowances together and pressing to one side before top-stitching. This was rather than pressing them open which the instructions recommend for most seams. I'm wondering if the extra ease would bother me less in a softer, drapier fabric. 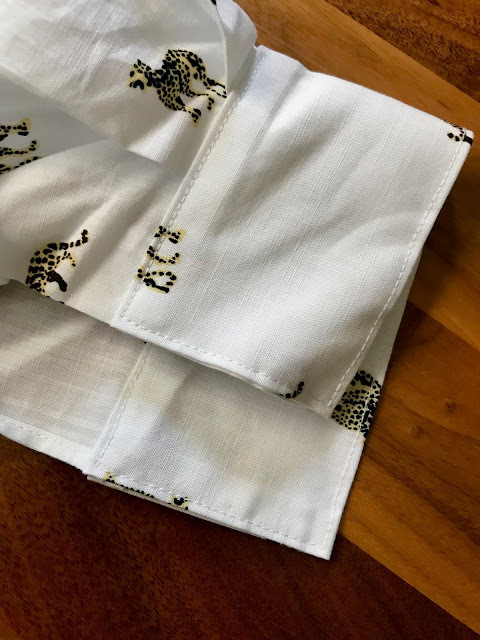 The crisp finish of this cotton does give the dress some body and in something like a silk crepe or viscose challis it might hang closer to the body. 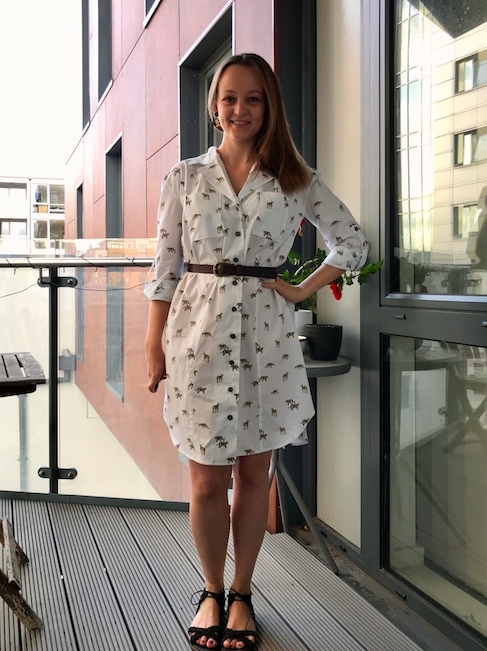 As it is I'm enjoying styling it with a belt at the moment but I'm sure I'll be wearing it without and will appreciate all the extra room around the body in the heat! The crisp finish of the cotton is actually what I like about it most. It is a very fine cotton (I will probably make myself a little cotton lawn slip to wear underneath this for modesty) but it has a really wonderful natural texture in the weave with you might be able to make out in some of the close up photos. Despite the crisp hand it is soft and smooth against the skin. It was delightful to work with as it holds such a lovely crease or clean edge when pressed. It made all of those little shirt details such a pleasure to construct. 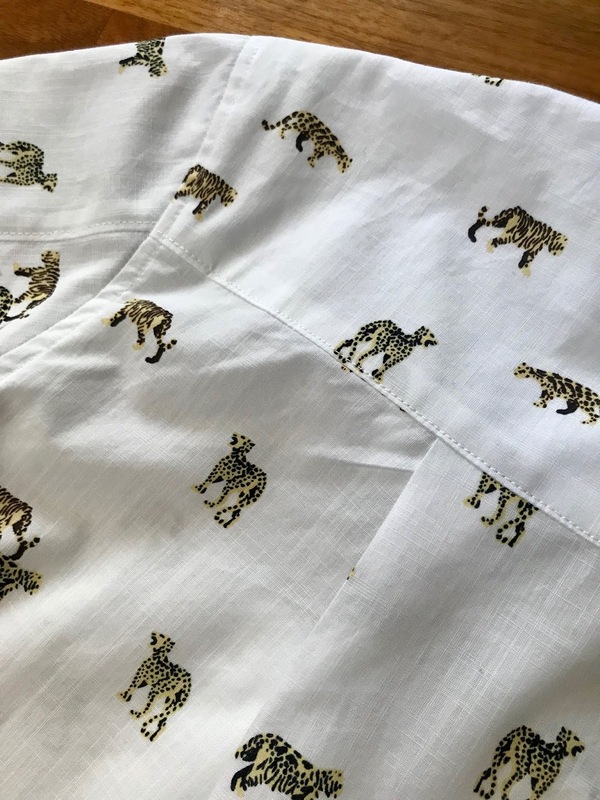 I didn't attempt any pattern matching as the big cats are so randomly placed but part way through construction I wondered if I should have as there are a lot of seam-lines going on with all those separate elements which has equalled lots of dissected cats! 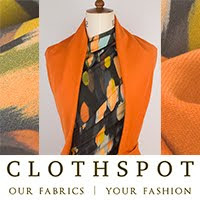 I used a lightweight woven cotton interfacing for the collar, cuffs and sleeve tabs. I wouldn't recommend interfacing the facing on this style as you want the front to hang nice and softly. 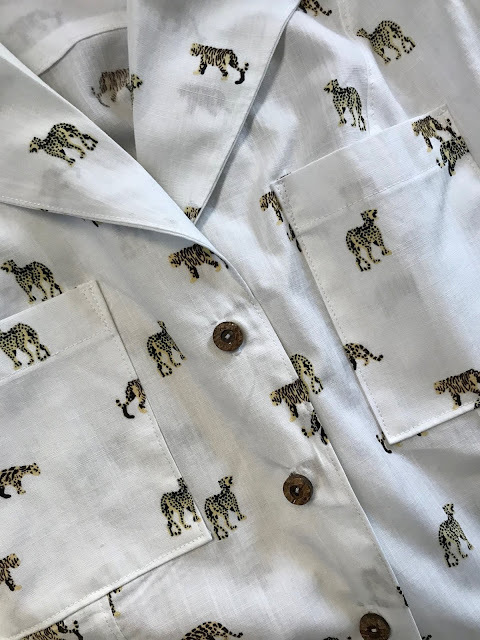 As the cotton is so fine when you have two layers of the cotton together the big cats from underneath show through and I thought this might look a bit messy and chaotic so I cut the inside yoke from some plain white cotton lawn and underlined my breast pocket pieces with the same. I did consider cutting the front facing pieces from the same but then realised they are turned back to form part of the collar so stuck with the big cats both there and under the collar. I got a bit stuck with what direction to cut the collar piece in as cutting it on the recommended cross grain would have meant cats standing on their heads and tails at the front. In the end I cut it along the grain so at least on one side the cats are standing up. The cuff pieces I cut on the cross grain so the cats faced the same way as they did on the sleeves. The buttons I think really pull the look together and I'm pleased I went with a darker choice. I love the natural wooden finish of these. I randomly had a couple of them in my button box which I must have sampled and not used for a show at work at some point but liked them so much for this project I put them in my purse to see if I could track down some more on my travels somehow. Luckily I found them again easily in John Lewis and they had just enough for my project! The pattern doesn't include any guidance for the placement or spacing of your buttons so that was quite interesting to figure out! I wasn't sure how far to overlap the centre front or how high the first button should be so I just went with what I felt looked right. The pattern calls for 8 buttons to fasten the dress but I've used 9, despite shortening it quite a bit so I'd recommend purchasing a few spare buttons. As my sleeves are permanently rolled up I didn't use the four recommended for the cuffs, just two on the tabs to finish them off. 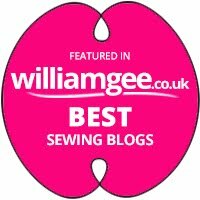 Thanks to Susan at Sewbox for giving me the opportunity to try out a Hot Patterns design. I'll certainly be giving another a try in future as the drafting and construction are great and they have such a wide selection of styles but I'll be sure to make a thorough muslin next time! I'm keen to make up one a more fitted style as I'm unsure how much of the size issue was due to the ease included in their drafting as standard and how much was down to the fact that this is an oversized style. This looks so cute on you! 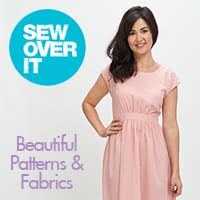 I have bought only one pattern from Hot Patterns but have yet to sew it up. I'm glad to know that they run big, so I will be careful with that. 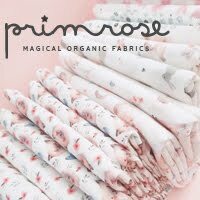 This fabric is beautiful! Thanks Shirley! Yes I definitely recommend testing the size out before you sew up your actual fabric but they are well thought out otherwise and enjoyable to put together. Thanks very much, I was so delighted when I found the fabric! This is amazing! The fabric is so cool. The dress is a lovely design too. I have quite a few patterns from Hot Patterns. I like the style lines. I've sewn up a couple of them and they do run big. I also noticed that the directions are sparse, but I have been able to sew them up, even as a newer sewist. They are worth a look for sure. This dress is so adorable. I think it will be perfect for your trip. Good to know that my thoughts on Hot Patterns are shared! I'll definitely be giving them a try again as the details are so well thought out and the construction methods are professional but to achieve the finish I wanted I felt like I needed a little bit of sewing experience under my belt. Thanks Francesca, I had taken on board your advice about them running big but didn't realise quite how big you meant haha! It seems a bit mad to me but other than that I was very impressed with the pattern so will definitely be trying more. As you say they have some lovely design details which will be heard to resist! I do wish there were finished garment measurements on there yes, will just have to be more thorough with my flat pattern measuring next time! Very good point haha! I think I will reserve it maybe for dinner or less dirty days haha! Lovely style and a great choice of fabric, all the little details look fabulous. Your sewing is immaculate! 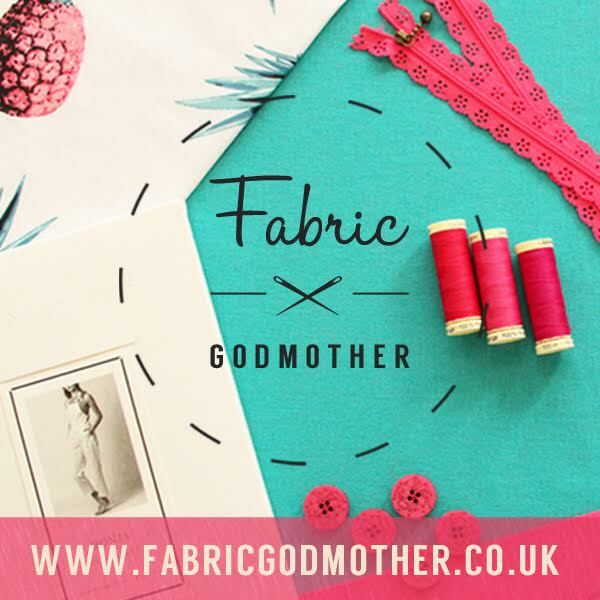 What fabric did you use please?